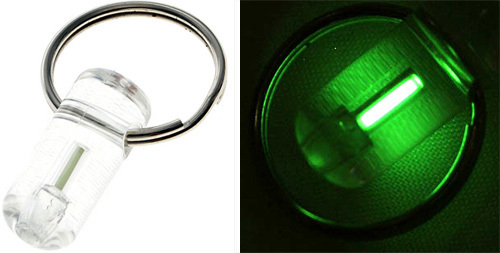 Mini Tritium Glowing Keychain Is Good For 10 Years | OhGizmo! By Andrew Liszewski on 03/31/08 • Leave a comment! Even if you’ve never heard of tritium before, odds are you’ve already experienced it. The radioactive material is used in compasses, gun sights, watches and other items you might need to use at night. While something like LEDs actually throw off far more light, the real advantage to tritium is that it doesn’t need a power source. In fact it will glow for years and years, even in complete darkness. The tiny piece used in this keychain will glow for about 10 years, and will ensure you’ll never lose your keys if you drop them in the woods in the middle of the night while the moon’s blocked out by clouds and you don’t happen to have a flashlight.